Once considered one of the ten most active volcanoes in the world, the Arenal Volcano is inarguably one of the most popular tourist destinations in Costa Rica. While it’s rare to see an explosion these days (the volcano laid entirely dormant from 2010 to 2012), the Arenal Volcano National Park and surrounding area offers adventure hikes, bird watching, or simply a relaxing soak in the hot springs. Many different communities live in the neighborhoods around the volcano’s national park, creating a unique blend of Latin and Western culture. Real estate around the lake ranges from rustic, traditional style homes to luxurious residences in gated communities. La Fortuna: The town of La Fortuna is the top tourist destination in Arenal and has many hotels, restaurants, bars, and resorts. However, the town is still small with a population of 10,000 people and just one main street. There are many local restaurants serving typical Costa Rican food as well as places serving Western dishes, a few grocery stores, banks, and even a nightclub with an almost exclusively local following. Most people use La Fortuna as their home base while exploring the nearby Arenal Volcano, La Fortuna Waterfall, and the famous Baldi and Tabacon hotsprings. 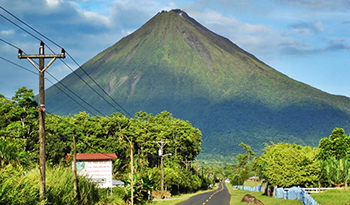 Expats who live in La Fortuna predominantly work in tourism. Nuevo Arenal: This small town sits on the northeast side of Lake Arenal at the base of the Arenal Volcano. It was created in 1973 when Lake Arenal was expanded as part of a hydroelectric project to provide electricity to the rest of the country. Today it provides easy access to many attractions including Lake Arenal, the Arenal Volcano National Park, and the Arenal Botanical Gardens. Despite its size, Nuevo Arenal has all of the necessities thanks to the growing expat population. Here, one can find grocery stores, a post office, banks, a pharmacy, and a medical clinic. There are many expat owned restaurants and cafes, bakeries, boutique hotels, Bed and Breakfasts, and art galleries, which create a great community feel around the lake.